nontoxic | Help! My Baby Is Allergic To All Food! I was asked a great question this week, and thought I’d share it and my answer with y’all. I’ve been doing a lot of reading about the different ways toxins get into our lives and the healthier alternatives. It’s rather overwhelming as I’m sure you know! Although I’d love to implement many of them, we are not going to spend a lot of money on it, so I am trying to prioritize what would be the most important areas to change. For example, would it be better to put money toward things that bother me, like a filter for our chlorinated tap water, or to buy natural body care products or organic foods or replace aluminum cookware,etc? We may do all of the above mentioned things eventually, but right now I’m trying to figure out if certain things are more likely to be problematic and should be addressed first. I totally understand your prioritizing question and went through that myself…still going through that a little. 1. A balance of cost and benefit, and if it’s one time or ongoing (e.g. Organic foods, substantial ongoing cost vs. replacing aluminum cookware, one time cost. Personally, I’d be tempted to delay organic produce for a bit and save that money to buy a water filter or stainless steel/cast iron/stone cookware). 2. Level of toxins for each. This is hard to determine, different toxins affect people differently. However, in looking at organic foods, you may choose to buy organic apples since they are in the top dozen of most pesticides, etc and buy conventional avocados, since almost no chemicals are used on them anyway. Or replacing toxic surface cleaners/disinfectants (you breath them 24/7 and touch those surfaces a lot) before buying organic bananas (not on the dirty dozen list and has a thick peel which helps some). 3. Just do one thing at a time, then the next, and before you know it you will have converted most of your stuff. I know it’s easy to panic and want to do it all at once, but slow and steady does win the race. This one is a marathon, not a sprint! 3. Natural body care products that stay on your skin or are cheaper than conventional. Of these items, a water filter and cookware are mostly one time costs; where body care products, cleaners and organic foods are ongoing costs. So, I would list the one time cost items in order of priority, and do the basic minimums (as money allows) on the ongoing items alongside of that. Without a doubt, I would get a Water Filter first, and not just a chlorine filter, but one that takes out fluoride, pharmaceuticals, heavy metals, VOC’s (volatile organic compounds, I think) etc. We drink water a lot, it’s obviously very essential to the body. We’re made of mostly water! It’s extremely important to our health to have pure water. There are tons of different types of filters available. Personally, we decided to get a Reverse Osmosis (RO) system that mounts under the sink. It seemed the best balance of cost, purity, and ease/convenience of install and use. The prices vary greatly, as does the quality and most expensive ones are not necessarily the best. We got ours from Costco for around $200. I know Sam’s Club has them too. And replacement filters (every 6 months) run around $50. My husband is quite a handyman and installed it himself, so there was no plumber cost. The rest aren’t as clear cut. I would switch to Natural Body Care Products as I used up the conventional ones, and spread out the initial change-over cost over time that way. And, you can do things like switching to natural bar soap instead of using liquid soap. The natural liquid soaps are really expensive, but the bar soaps are cheap and long lasting, so I actually spend less now on soap than I did before I went nontoxic! I do get liquid soap (nontoxic, but not organic) for the kitchen though. And here you really have to think through how you use products and where to spend money. Personally for kitchen soap, it’s on my hands briefly and I wash it right off, so I just get something real basic, not the best. Now lotion, where I rub it on and it soaks in (so some of it ends up in my blood fairly quickly without the slight benefits of filtration through the digestive system) I’m willing to spend a little more. Make up falls in this category as well! Non-toxic Cleaning Products – I would do this similar to the body care products, where I replaced things as I used them up, and spread out the initial cost that way. Something easy to forget is that most cleaning products have fragrance, the chemical kind, not the natural God-made kind. By far, the majority of these fragrances are toxic (not to mention all the actual toxic chemicals for cleaning in these products), then combine tens or hundreds, even thousands of the chemicals in one product and we spread them around our homes, in every room, on most surfaces where we breath them in and touch them repeatedly. Just think of little feet and hands crawling across a freshly mopped floor (absorbing all those chemicals through the skin), and then sucking a thumb, all while breathing in the vapors! Or wonderfully smelling freshly laundered clothes, covering the body, sitting on the skin 24/7 allowing skin to touch and absorb those detergents and dryer sheet chemicals and fragrances. Since these impact us 24/7, and they are completely loaded with chemicals (that’s what they made of) replacing them ranks pretty high on my priority list! Cookware and Food Storage – As a one-time cost priority, I would put it after a water filter. I don’t know about you, but for wedding gifts and hand-me-downs from grandparents and stuff, I got corningware ceramic casserole dishes and glass bread pans, etc. Yet, I totally forgot about the corningware when I went to bake something I had always baked in a 9×9 or 9×13 aluminum pan. I had to realize that it was okay for bread or brownies or whatever to be round or oval and not square. That alone saved some money and let me feel like I could wait to buy alternatives. I’m not always the best at thinking outside the box! That’s baking. Cookware – fortunately, I had bought a stainless steel set with wedding money when we were first married, so I didn’t need to replace much of my cookware. If you garage sale (or visit antique shops), you can often find some great cast iron skillets and things for cheap – and that can generally go in the oven or on top of the stove! Also, many of these items fall in price ranges where you can put them on a wish list for gifts. Food Storage – I would do this after cookware, replacing plastic with glass (pyrex-type). Organic Foods – There is such a range here, from eating only organic, to just getting a few things organic, so it’s hard to say, and it can eat up a lot of money. Personally, I’ve come to where I try to get “The Dirty Dozen” organic, and things extra hard to wash (not that washing actually gets the chemicals out of them, but probably does reduce exposure a little) e.g. spinach, lettuce, broccoli; and things close to the same price as conventional e.g. carrots I can usually find organic for about the same price, but if they happen to be way expensive that week and we need them, I get conventional. You can look up the Dirty Dozen – the fruits/veggies with the most pesticides on the Environmental Working Group website (I need to look it up again myself!) Oh yes, and for foods that are mostly genetically modified (GMO) nowdays – corn, soy – I try hard to get those organic too, so that we don’t eat GMO stuff. So, for example, nacho chips (corn) – we only get organic, but Costco has huge bags really affordable. This area, and how far you can go, is something you really have to decide for yourself. Someday, I hope to be able to do more organic (we will soon, my husband is building an aquaponics system in our backyard to grow our own veggies and fish), but for now, we do the most toxin containing foods organic (prioritized in this order): oils (fats/oils are where toxins are stored, so we only get organic oils), meat (grassfed or wild), eggs (preferrably free-range, but at least organic), foods normally genetically modified (corn, we stay away from soy, generally), and the “dirty dozen” fruit/veggies. 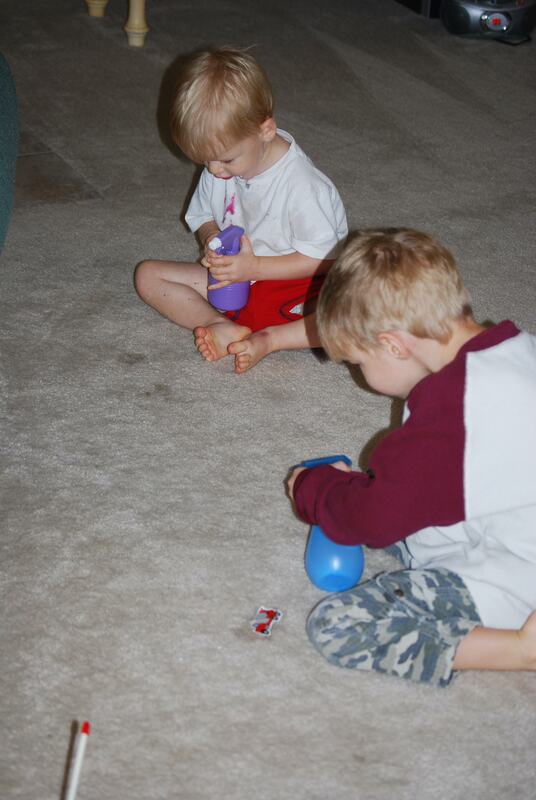 My nontoxic carpet spot cleaners! A lemon juice water mix in spray bottles.